Both the ebook and hardcopy versions are available on Amazon.com! After an eventful summer that bled over into the fall, Ten Parts In The King has undergone some minor edits and has been republished under the single authorship of Peter G. Rambo, Sr. Most exciting in the republishing is the fact that the book is now available worldwide. The ebook version is $3.49, while the hardcopy is still $12.95. I want to thank everyone for their patience and support in the republication and hope you will join me in promoting this excellent (I am biased) book by giving a few copies away, sharing with friends and reviewing on amazon,com. Our book on sale at M. Judson Booksellers! After months of preparation, we are glad to say that Ten Parts in the King is now available! And why should you order a copy of Ten Parts in the King? That’s a question we did our best to answer at our book launch on January 21. 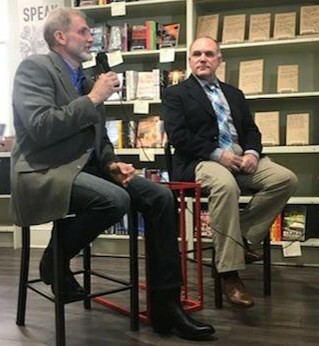 It was an intimate event with a small gathering of friends and family at M. Judson Booksellers in Greenville, South Carolina. We had hoped to live stream the book launch on Facebook, but that proved a technological challenge beyond our ability to conquer. We did record it, though, and hopefully in the next few days will be able to post the video. David Altman of Key of David Publishing facilitated the book launch. 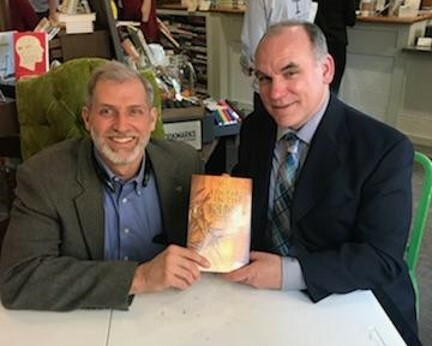 David Altman, representing our publisher, presided over the event, and both of us had opportunity to share some thoughts. The story of the book’s origins is something we explain in more detail elsewhere (such as in our radio interview on Reunion Roadmap). 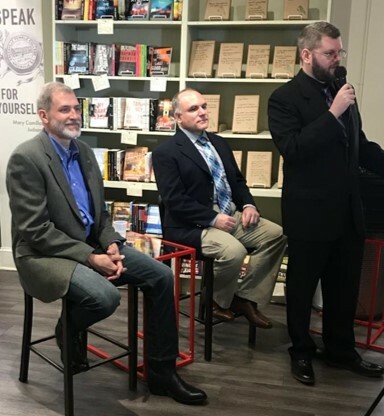 What we shared at the book launch focused more on our hopes for Ten Parts in the King: that it might reach our brothers and sisters in traditional Christian churches who may not yet understand exactly what the covenant nation of Israel is, and their relation to it. Our remarks included a challenge to our audience to place the book in the hands of their pastors, teacher, friends, and family. We believe Ten Parts in the King is a revolutionary tool for awakening our brethren to a very important part of their identity that they may never have considered before. Moreover, we believe it is something that will help explain why Christianity and Judaism continue to exist side by side – in fact, as the Two Witnesses to God’s redemptive plan for all nations. 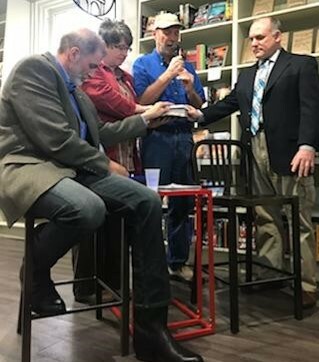 Authors Pete Rambo and Al McCarn field questions from the audience. That part of the program caught the attention of a Jewish lady from Charleston who happened to be visiting Greenville that day. It puzzled her to encounter people who said the Shema, wore tzittzits, and seemed to be Jewish, but identified as followers of Messiah Yeshua. We had a pleasant conversation with her, and she parted with a signed copy of the book. Tommy and Dorothy Wilson lead prayers of dedication for Ten Parts in the King. What happens next is largely up to our readers! We have ideas for future projects, including expanding our website and taking Ten Parts in the King on the road for speaking and teaching events as opportunities arise. If you are interested in having one or both of us come to your fellowship, church, synagogue, or other group, just email at editor@tenpartsintheking.com. Of course, we are not the first to present such a message, nor will we be the last. Key of David Publishing has been a voice for this same message for a generation, and still offers a number of relevant works by Batya and Angus Wootten, Ephraim Frank, and others that amplify this message from a number of perspectives. Ten Parts in the King is the first of a new generation of publications that will carry that message forward in days to come. Plans for these new works are in progress, so watch for updates! The authors with their book. The fun job of autographing books! © Albert J. McCarn and Peter G. Rambo, 2017-2018, all rights reserved. For requests to use and/or duplicate original material on Ten Parts in the King send a request at the Contact Us page, or send email to editor@tenpartsintheking.com. YOU are invited to the Ten Parts in the King Book Launch!! We have secured a really neat place for the launch of Ten Parts in the King! With books set to begin shipping on Thursday, January 25, 2018, we thought a book launch a couple days before would give some of our treasured local supporters and prayer partners first opportunity to hold these beautiful volumes! 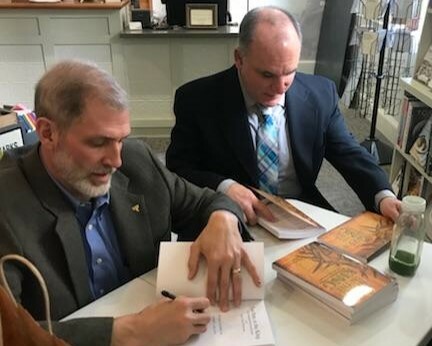 The Plan: Co-authors, Pete Rambo and Al McCarn will give a short presentation and dedicate the book before signing copies for sale. Our hope is to film and possibly live stream the event for many from across the planet who can’t be there but have expressed excitement at the book’s release. Watch for details. Mark your calendar, share this to your media circles and bring a friend!! We would love to see you there! Publication Update: Open for Business! 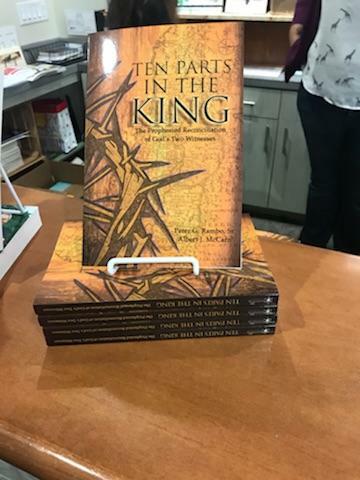 We have exciting news: Key of David Publishing is now accepting preorders for Ten Parts in the King! Orders will be filled starting January 25, 2018, which means you can have it in your mail box very soon after that date! This is the news we have been eagerly awaiting for a long time. Nine months, in fact. We started this project in mid-April, soon after we heard about Rivkah Lambert Adler’s book, Ten from the Nations. Rivkah inspired us to start working on this project which had been on our hearts for several years. Now, after nine months of labor and eager anticipation, we are at last able to announce the imminent birth of our literary baby! Will you be in the neighborhood of Greenville, South Carolina around January 21, 2018? That’s the date we’re considering for our book launch event. We’ll have an announcement about that as soon as we can get the details arranged. That’s the news for now! If you have any questions, please contact us at editor@tenpartsintheking.com. And, help us spread the word! Did you ever think that a simple punctuation mark could cost $10? We didn’t either. Then we took our plunge into the publishing industry! Comma Chameleon courtesy of SnorgTees. As we reviewed the proofs of Ten Parts in the King over the weekend, we found a few things that needed attention. It’s amazing what you miss after working for months on a manuscript! For example, everyone knows that you shouldn’t put a “v” in “rabbi,” but somehow we managed to do it. That’s just one of several typos and other corrections we found. We’re happy to say that there were not many, and that the most significant correction was rewriting one sentence that somehow got garbled in our many previous edits. Having satisfied ourselves with the results, we sent the corrections back to the printer on Tuesday. Now we’re simply waiting for news on when the job will be finished. Once we hear that news (and it could be any day now), we’ll be able to accept preorders through Key of David Publishing. Now about that $10 comma. There is one place in the book where it seemed to make better grammatical sense to add a comma. Then we realized that every page we changed would add $10 to the total print cost. After thinking it over, we decided that such a price was a bit too much for a single piece punctuation mark! Besides, it’s more fun to let our readers make a game of it and see where that comma should have been. © Albert J. McCarn and Peter G. Rambo, 2017, all rights reserved. For requests to use and/or duplicate original material on Ten Parts in the King send a request at the Contact Us page, or send email to editor@tenpartsintheking.com. Publication Update: The Proofs Are Here! It’s been only two weeks since we sent our manuscript to the printer, and today the proofs arrived! Just yesterday the printer had asked about four of the images in the book. Since they were not at the recommended resolution for printing, the question was whether we would replace them, or continue with what we had submitted. 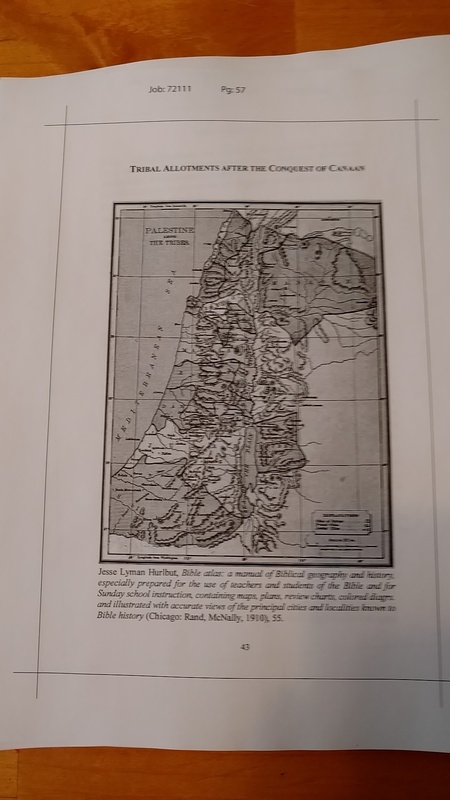 As we reviewed the images, we decided only one picture might be a problem: a map of the division of Israel according to tribal territories. That potential problem was not enough to stop the process, so we asked the printer to continue with the manuscript as is. That was yesterday morning. We didn’t expect to see the proofs until next week, so it was quite a surprise to see the smiling UPS man at my door this morning! As of this writing, Pete hasn’t had a chance to see his copy of the proof (that’s one advantage to working at home! ), but I have done a quick review. Everything seems to be in order. And that questionable picture? As you can see, that particular image seems to have turned out quite nicely – even better than some of the higher resolution images! We will take the weekend to review the proofs closely to see if there is anything that needs tweaking. Assuming all is well, the printer tells us the job will take about 4-6 weeks to complete. That means we’re now looking at mid- to late-January as the availability date. We’re a bit disappointed at not having Ten Parts in the King published this month, but perhaps it’s better that way. Now the book will come out after the holiday rush, and we have more time to plan a proper book launch. Thanks again to everyone who has prayed for, contributed to, edited, and advised us on this project! We are so excited to be one giant step closer to having it done. If you have any questions, please contact us at editor@tenpartsintheking.com. And, help us spread the word! The journey is finally over, or more likely, it is just beginning! But, today we are most thankful. Ten Parts in the King went to the printer yesterday afternoon!! In a few days we should have a proof copy in hand to take a quick final look at before the first print run of a scant 2500 copies is ordered. prayer warriors who stood in the gap lifting this project. If this book is successful, it will not be because we are special or have any real effect, but it will be because it is time and our Father desires this message in the hands of the many. My secret prayer is 100,000 copies peppering this continent. Pray that with me and watch the Father make some HUGE moves for the Kingdom!! Today, we’ll relax and enjoy some turkey. We’ll fellowship with family and friends. We may even watch some football, but mostly, I know Al and I will take a relaxed deep breath that the book is finished and we merely wait expectantly for the proof copy. Next week, we can begin planning the book launch, promotions etc. Today, though, we are simply thankful for the great grace and mercy of our King and His timely provisions and blessings. Publication Update: To the Printer! This is a very short update with some very important news: Ten Parts in the King is now in the hands of the printer! We find the timing appropriate: just as Americans are getting ready to celebrate Thanksgiving (a feast which, by the way, has connections to Sukkot), we have another reason to be thankful for all the provision of our Creator. Not only have all the technical details been resolved, but the donations received have covered the cost of the first printing! Once again we offer our deepest thanks to our generous contributors. May the Lord return this blessing to you all many times over! The next step is to receive the proof copies from the printer and review them for accuracy. Once we’re satisfied with the product, the print run begins, and we’ll know when the books will be available to the public. As that happens, we’ll also be able to start accepting preorders. We do appreciate your continued prayers. Our hope is still to have the books in your hands before the end of the year. Even though we’re very close to the finish line, we still have a way to go. Every step thus far has been according to our Father’s timing and with His provision, and we expect nothing different as we enter this last stretch! We’re in that tedious part of the final stages of publication: we’ve done all we can do, and now we’re waiting on other people to do their part. Specifically, we’re waiting on the Library of Congress to issue us a control number. That’s the last thing before Ten Parts in the King goes to the printer. Then we get to work with the printer to make sure the proof is just right, and when we’re all satisfied, the print run begins. Sounds tedious, doesn’t it? But fear not! Every day gets us one step closer to having this work available to the reading public. In the meantime, we’re gathering our thoughts for follow-on articles on this website. With Ten Parts in the King as the foundation, we hope to present a continuing series of posts to expand on subjects we just didn’t have opportunity to cover adequately in the book. Thomas Jefferson was instrumental in establishing the Library of Congress as the national library of the United States. Now we’re only waiting on the LOC to record our book before it goes to print! Keep watching this site! We’ll provide updates as the news comes in. In the meantime, if you’re inclined to help finance the first printing, click on the donate button below. We have had tremendous response in the last two weeks, and are only a few hundred dollars short of the full amount. Thank you to everyone who has helped us get this far! To donate any amount, please click on the button below: That’s all for now! If you have any questions, please contact us at editor@tenpartsintheking.com. And, help us spread the word!